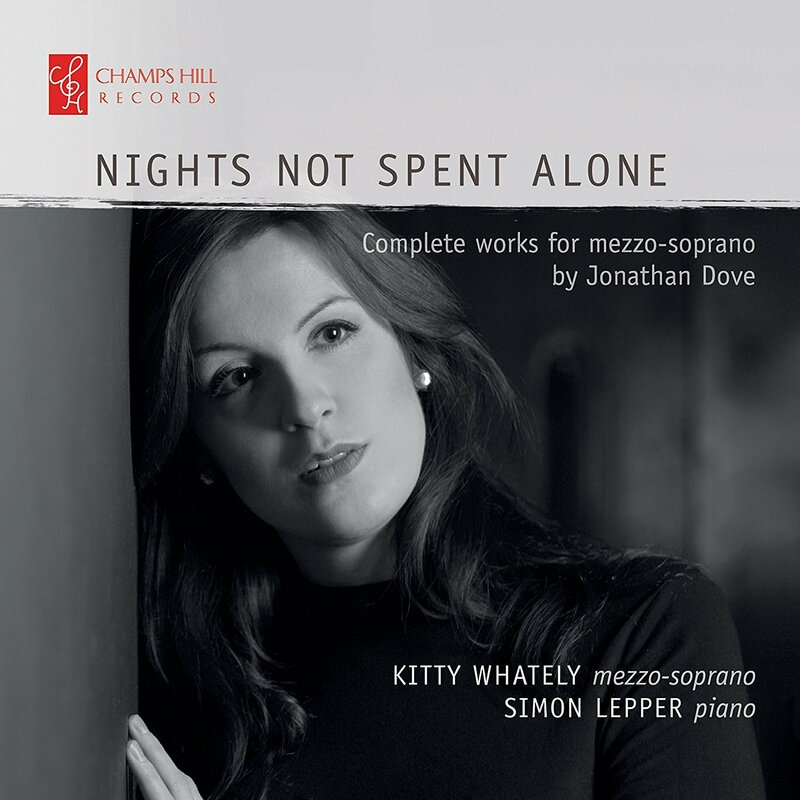 This new disc from Kitty Whately and Simon Lepper on Champs Hill Records presents Jonathan Dove's complete works for mezzo-soprano, My love is mine, Five Am'rous sighs, All the future days, Cut my shadow, Nights not spent alone, and All you who sleep tonight setting texts by Ursula Vaughan Williams, Mary Wortley Montague, Matthew Prior, Vikram Seth, Edna St Vincent Millay, Federico Garcia Lorca. The works on the disc cover a wide range of Dove's career from 1996 through to 2015, and the songs present a more varied, and perhaps more intimate view of Dove's composing than we get from his operas. In fact, some of the songs were premiered with the composer at the piano. The disc opens with the only single song on the disc, My Love is Mine (setting words from the Song of Songs). This is a rapturous unaccompanied song, with Whately combining warmly seductive tone with superb diction. Five Am'rous Sighs, dating from 1997, sets poems by Lady Mary Wortley Montague and Matthew Prior with Dove conjuring a variety of amorous moods, ranging from the languorous eroticism of 'Between your sheets' to the vivid rhythms of 'Finish' and 'All these dismal looks and fretting'. Yet many of the poems finish with a witty sting, and Kitty Whately combines appealing warmly lyrical tone with a nice gleam in her eye. All the future days sets poems by Ursula Vaughan Williams, a sequence of seven quite dense, philosophic poems. It was commissioned as a birthday present and premiered privately by Anne Mason accompanied by Jonathan Dove, in 2004. Dove sets them with lyrical intensity, with some magical piano writing to create a series of lovely textures. With the final song 'The Siren', with its dazzling piano textures, really taking us into the world of Dove's operas. Kitty Whately really makes these songs sing, bringing out the warm beauties of the vocal lines, always shaping the sense and the words. Simon Lepper dazzles at the piano, sometimes sounding as if he has three hands. Cut my Shadow, from 2011, is far darker, edgier and more complex. It was written for the mezzo-soprano Buddug Verona James. It sets three Federico Garcia Lorca poems (in English translations) and the atmosphere is bleaker, with Whately and Lepper giving the songs a spare intensity which matches Lorca's poetry. This is Dove exploring a rather different world to some of his more lyrical music, and whilst still approachable the songs have a toughness about them which reflects the powerful images of Lorca's poetry. Nights not spent alone sets poems by Edna St Vincent Millay. The cycle was commissioned by BBC Radio 3 (where Kitty Whately was a New Generation Artist) and the Royal Philharmonic Society's Young Artist's Scheme, and it was Whately who suggested the poet to Dove, and Whately (accompanied by Simon Lepper) premiered the cycle at the Cheltenham Festival in 2015. Dove's piano writing here again evokes some of his operatic writing. The first song 'Recuerdo', with the piano evoking both the sounds of the ferry and New York, is like a small operatic scene. The three contrasting songs make a complex, yet seductive trio. All you who sleep tonight is a cycle of 13 short songs, dating from 1996, to poems by Vikram Seth. Here Dove brings in a few cabaret influences, the songs were written for the mezzo-soprano Nuala Willis (who created at least seven roles on Dove's operas), whom Dove accompanied in cabaret. Here Dove is writing music which spans from cabaret to the more classical. It calls for performers of great flexibility as the songs are not all about wit, 'Telephone' has a spare bleakness about it, whereas 'Prandial Plaint' moves into Sondheim territory. Each of the cycles on the disc is, to a certain extent, a portrait of the singer for whom it was written. Kitty Whately shows herself something of a chameleon as she brings out the distinctive character of each cycle, yet never loses her own qualities, the creamy warm tone, that delightful frankness of utterance, the superb diction and the sense of storytelling so that each song, no matter how short, makes a real narrative. She is joined on this journey (or these journeys) by Simon Lepper who, equally chameleon like, brings all Dove's different piano parts alive and encompasses both the complex operatic and the real cabaret. This is a completely engaging disc, as Whately and Lepper seduce you with a fascinating combination of musicality and storytelling, whilst Dove's songs show his familiar sense of being approachable whilst never overly simplistic or seeming to writing down. There is a mixture of beauty, ease and questioning here which really engages.